Want an idea of what one of my guitars sounds like? Help yourself to any or all of the free music selections here. I took one of my guitars, just prior to it’s sale, into a friend of a friend’s recording studio, asked him to turn off any and all dsp’s and eq’s, set all tonal controls “flat”, and then I proceeded to play live into a pair of condenser mics, the mixing console acting only as a preamp into an ADAT. While cutting out the riff raff and mixing down to a cd, the engineer begged me to let him add a touch of reverb. I conceded, as it was quite dry. But other than that, this is as honest of a recording as one can get. 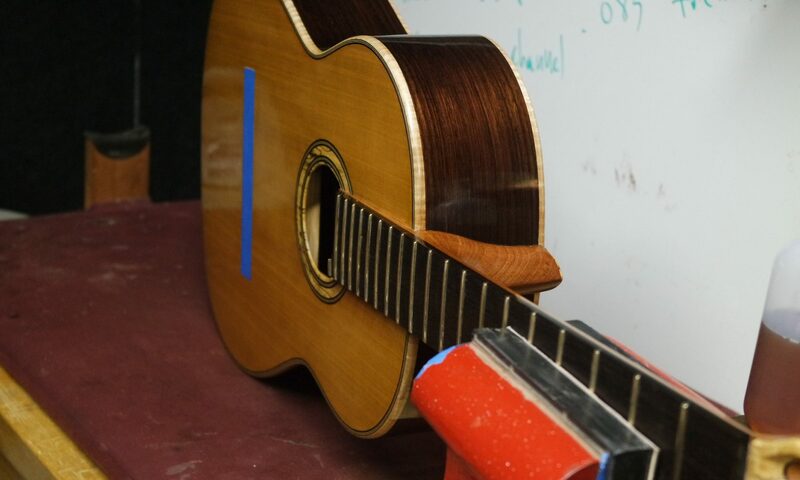 note from Ken: the following recordings were made with guitar #4, a cedar top braced with an open 5 brace fan using sitka spruce, SE Asian rosewood was used for the back and sides. Shortly after the recording, a ban was imposed on the export of rosewood from that region, and only recently has it been made made available again. Of course the price has increased considerably! The first 4 tracks are from Oscar Chilesotti’s “Six Lute Pieces of the Renaissance”. Tracks 5 and 6 are by the baroque guitarist Ludovico Roncalli. Tracks 7-11 are 4 studies from Matteo Carcassi’s famous collection of 25 Estudios. Tracks 12 and 13 from Segovia’s (in)famous collection of 20 Sor studies. And 14 and 15 are a couple of Romantic era chestnuts from Francesco Tarrega. Enjoy!